An adventurous Tanzanian safari experience is not only about spotting wildlife via varied activities. It is about the supplementary experience of the wilderness, the awareness of isolation from the material world. It is about spiritual renewal which is stimulated by a combination of relaxation, excitement and awe – surpassingly offered at Kwihala Camp. The camp’s goal under the parent brand of “Asilia” is to fulfill that part too and also to provide a comfortable and aesthetically satisfying African vacation base from which to explore the breathtaking but little known Ruaha National Park: over 20,000 square kilometers of untamed landscapes ranging from parched grasslands to lush riverine forest; from the rocky highlands of the Ruaha Escarpment to the sand rivers of the elusive Ruaha Valley. 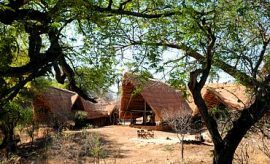 Named for the beautiful landscape bushland in which it is set, Kwihala is set within the vicinity of the Mwagusi sand river towards Kimilamatonga Hill and the permanent waters of the Great Ruaha River. 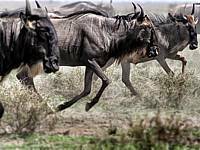 Thousands of elephants, wildebeest and buffalo congregate on the plains, while many rarer ungulates, magnificent sable, stocky roan antelopes and bearded, spiral horned greater kudu frequent the surrounding miombo forests. Lions, leopards, cheetahs, jackals and hyenas follow the herds and the unaccompanied, and packs of African wild dogs are not uncommon. Kwihala is not easy to access, but its remoteness and pristine location is well worth the effort. 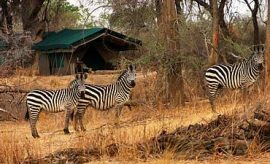 Flying in from Dar Es Salaam or Arusha to Msembe Airstrip, AfricanMecca guests will be met by a Kwihala guide in a shaded, open sided 4x4 and will be driven to the camp experiencing their first sixty minute game viewing trip in Ruaha. 6 well-spaced and individually isolated Kwihala tents with shaded verandahs, safari chairs and table provide all the basic comforts for travel in Africa in a delightfully ethnic living area designed by decorator Jacqui Resley with almost Zen simplicity. (The tents are not permanent, but can be sometimes seasonally moved as seasons, ecology and game movements dictate.) Hanging bead and rope artwork, dried flower arrangements and the subtle zebra black white casing on towel handles, basin tap to lampshade stand emphasize the closeness of the wild, separated from your airy quarters only by a screen of fly-proof mesh and a canvas wall (read more on where else to stay in Ruaha Park on your East African safari). Wooden beds are comfortable with fresh linen and fleecy blankets. There are bedside tables, a writing desk and chair and drawers and hangers for your clothes. Bottled water is provided for drinking and for brushing your teeth. Solar lighting is standard with battery charging facilities, but it is not sufficient to permit the use of hairdryers. 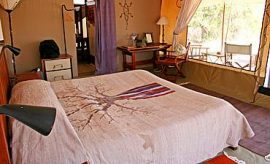 The en-suite bathroom has a flush toilet and hand wash basin as well as a bush shower, a delightful experience after a hot, dusty day on a Kwihala safari. 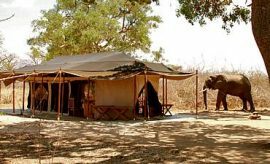 For families planning their AfricanMecca safari, note it is not permitted to bring children under six years of age to Kwihala Camp on your Ruaha tour of Tanzania, since large mammals roam at large through the unfenced camp. 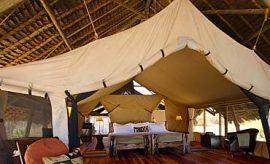 A two-tiered pagoda-shaped central mess tent with open mesh walls commands stunning views of Mbagi grasslands studded with thorn bushes and backed by blue upland ranges. 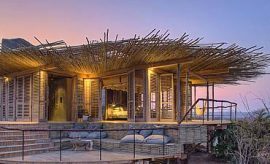 It houses bar, dining area, lounge and library with easy safari chairs. Travelers on tour in Africa can be sure of an unsurpassed safari experience at Kwihala. 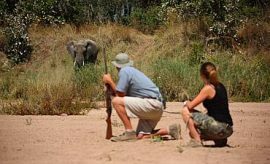 Game walk safari guides take you for an in-depth lesson on reading the bush. Tracks and droppings tell you what animals have been where or headed to, what they have been doing and when. Busy clusters of red beetles are found on relatively fresh droppings, but you can poke apart dry aged dung to see if fur or feathers are present, or to identify tiny undigested bones. Bird watching is unbeatable in Ruaha from November to March with more than 570 recorded species, including many migrants, most of which will display their mating plumage at this time of year. Game drives take you farther afield to watch less common sights. The 4x4 jeep is shaded and carries refreshments and on-board radio. Wear loose, light, natural colored clothing that blends with the flora, not white or bright, which will spook the animals, nor blue, which may attract tsetse fly. Long sleeves and a hat will protect you from the sun. A light fleece will keep AfricanMecca guests warm in the cool early morning and evening breezes. Leopards are elusive, secretive and cheetahs fast, but you can safely drive close to decide if what you see is a rangy cheetah with regular round spots and striped muzzle, or a leopard with irregular clusters of spots like four leafed clovers. On an exploratory tour in Ruaha National Park, you will feel truly alive with a sense of adventure that changes your awareness of what life is all about. You will reclaim the wonder of childhood in the beating of an awed heart. Food at Kwihala Camp in Ruaha Park is generous and full of flavor, cooked in a Tanzanian holiday style in a covered bush kitchen on charcoal and wood-burning stoves with amazing skilled chefs. Fresh bread and pancakes are made daily. Breakfast consists of fresh fruit, cooked eggs, potatoes or toasts as ordered, taken in the dining tent, and lunch of pies, meat sandwiches with salads or vegetable dishes followed by fruit can be eaten in the mess tent or packed to take with you on a daily game drive which is included in your safari package. An afternoon siesta before a later game drive enables you to spend the sunset hours watching the spectacular colors of the evening sky as you sip sundowner cocktails al fresco, or you may prefer them around the base camp-fire, swapping AfricanMecca safari tales with your fellow travelers. In the evening, a three course dinner is offered which can be enjoyed in the dining tent where there is solar electric light, or by lantern light at a pre-selected site under the velvet night sky, bright with stars. Listen to the hypnotic sounds crickets and cicadas as you immerse yourself in the bush ambience. 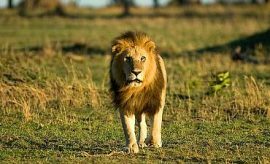 Later, the whoop of hyenas and bark of jackals, and the roars of a pride of lions sounding more like creaking, barking groans will chill your blood as your armed guard escorts you back to the safety of your tent (read more on when is the best time to visit Ruaha National Park). 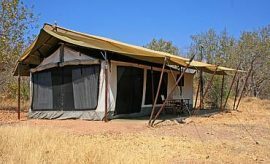 When staying at Kwihala Camp in Ruaha, we recommend combining it with offbeat parks in Southern and Western Tanzania such as Selous or Katavi ending with a chimpanzee trekking safari at Gombe or Mahale.